Akron, Ohio, October 24, 2013, 12:48 am -- /EPR NETWORK/ -- Ultragloss is pleased to announce that they are now offering franchise financing. Their new franchise fee is 50% less than their original franchise fee and they're financing it at a rate determined by the sales of the franchisee. 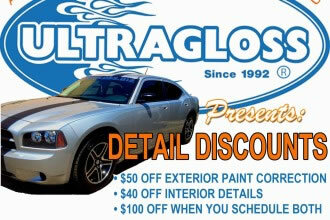 Ultragloss is a mobile automotive franchise that primarily services used vehicle dealerships. Their specialized products and technological advancements put them ahead of the competition. These products lower the amount of time their franchisees work on a vehicle, which may increase their profits with the added benefit of giving their clients great rates. Ultragloss Automotive Appearance Specialists take pride in their work and their lot management. Their approach to the industry and the way in which they work with their clients to help them achieve their goal of selling more cars is what differentiates them from their leading competitors. This company took a proven mobile franchise system and modernized it to meet the demands of the fast-paced automotive industry. Ultragloss has grown in times of economic recession due to the rising demand for used vehicles. It's a great time to get into a franchise that refurbishes the very product we use everyday: our vehicles. Now that Ultragloss is offering financing, the dream of mobile franchise ownership is possible for many who would have a hard time getting a traditional business loan. * So if you like cars, working with your hands, the outdoors, and the instant gratification that comes from improving something: Ultragloss is the franchise for you. Ultragloss is a growing brand that has been received well across North East Ohio and elsewhere in the state. Its fresh image leaves a lasting impression. Given it's a mobile franchise, there is less overhead when compared to a fixed location. There's stability because Ultragloss Automotive Appearance Specialists are trained to work with dealerships and become a part of the dealership's team. This translates to regular, weekly business. The security of knowing you are working with a dedicated franchise team who will not only train you from the moment you sign the franchise agreement, but they will also help you solicit accounts and get you started working on the lots. See Ultragloss training for more information by clicking here. There is the added benefit of working in an in-demand industry that creates job security for franchisees. Dealerships grow to rely on Ultragloss services because they see the value of investing in an Ultragloss style repair that enables them to charge more for the vehicle than they would have prior to correcting the damage. Is the Ultragloss Franchise Right for You? � Are you an independently hard worker, capable of self-starting and plugging into a proven system? �Are you motivated to run your own business? �Do you enjoy vehicles and working on them? Or are you planning to partner with someone who does? �Do you like working outdoors? �Do you enjoy working with your hands? �Are you financially ready to take a leap into the realm of self-employment? If you answered yes to those questions, what are you waiting for? With the new affordable franchise fee financing and proven mobile automotive system, apply today (http://ugafranchise.com).